This morning I got up early and installed the back linings on the cello. 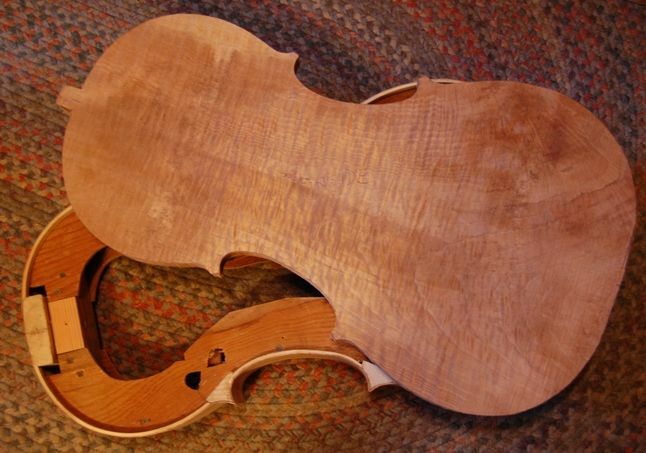 While the hot hide glue dried, I set up a violin for a friend, whose grandfather had left it to him. Once the glue was dry, I removed all the clamps, planed the ribs to be fairly level, and traced the outline of the back plate, using a very short section of aluminum tubing (5mm long, 25mm diameter, 3.5mm wall thickness) and a ball-point pen, to trace around the ribs and mark the maple slab from which the back was to be cut. The tubing is tall enough (5mm) to never slide under the edge of the ribs, even if there is an irregularity on either the ribs or the plate, and the 25mm diameter rolls along steadily and easily along the side of the garland itself, making it a fast, pleasant task. I cut the plate out on a bandsaw, only using a scroll saw for areas too difficult to access on the bandsaw. Then I smoothed all the edges on an oscillating spindle sander. I do not use many power tools, but the saw and the sander are two that I consider indispensable at my age. They save me a lot of wear and tear on my joints. I have built instruments using all hand tools…no power tools at all…but I do not consider it a virtue, and probably will never do it again, if I can help it. I still have the bow-saw I built for that fiddle project, and all the files, planes and scrapers. The only one I no longer use at all is the bow-saw. It hangs on the wall reminding me of that early violin. Arching is next…but I am pretty tired, so I don’t think I will start today.